External cladding is a method of placing a veneer of one substance over the exterior of a building. This provides several benefits to the surface including increasing the resistance to damage and weather, in addition to the increased aesthetics. Resistant: As most external cladding materials are stronger than other materials such as wood, it is much more resistant to damage from outside forces. Strength: Another benefit to exterior cladding is its ability to bear & support a structural load. Visual appeal: External cladding effect can add an appealing design to the exterior of any building type. View some cladding effects used on houses here and see for yourself. Stone cladding has a wide range of benefits stretching beyond its original and distinctive appearance. A major benefit of stone cladding is its ability to act as both a noise and heat insulator for your home. Quality stone cladding can greatly reduce external noise such as traffic and roadwork’s. Good stone cladding has a great ability to keep internal temperatures constant despite external temperatures, whether they are hot or cold. This can be a great help when trying to reduce both your heating costs and carbon footprint. 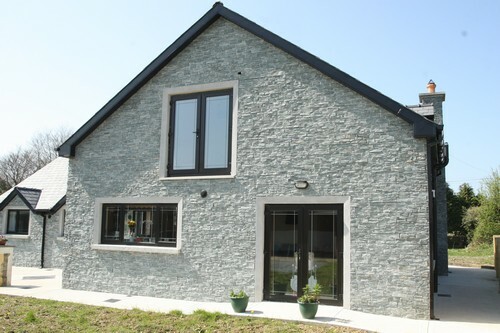 Stone cladding materials such as granite and sandstone are extremely durable and act as a great first defence against harsh weather conditions. For more information on the benefits of stone cladding then read the full article here. At S&N Granite, we have an extensive range of cladding materials such granite exterior cladding and sandstone. All of our stone cladding finishes are applied with ease at a fast rate ensuring there are no interruptions to the use of your home or business. Whether a homeowner wants entrance pillars or stone gate posts as the entrance of the home or wants stone walls to surround the property’s perimeter, the finest quality stone crafted my natural stone experts is the key to achieving the best results. 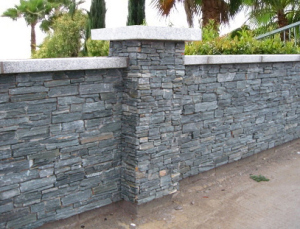 Stone walls and entrance pillars are available in a broad array of materials and designs but it takes the hands of skilled craftsmen to achieve a professional, polished & high end result. When it comes to material, granite is the premium choice for stone gate posts. Almost three times as strong as cement, granite is so durable that it will outlast almost any other material. There are a number of factors for the homeowner needs to consider when choosing materials for the design and construction of their home. Primary items to be considered include the cost of materials, their maintenance requirements, longevity and durability, and of course the aesthetic value of the product selected. Window sills are often the starting point for the design of a home exterior and a popular choice of material is granite. Why choose granite sills you may ask?